Riding Out Irma On Florida's Space Coast — And Keeping An Eye On The Spacecraft : The Two-Way At the Kennedy Space Center, riding out a hurricane means something a little different. You have to keep the Orion Multi-Purpose Crew Vehicle capsule happy. NASA's Kennedy Space Center in Cape Canaveral, Fla., shown on Saturday, closed ahead of the arrival of Hurricane Irma as a crew of 120 arrived to ride out the storm. Snacks? Check. Bottled water? Check. Orion capsule? 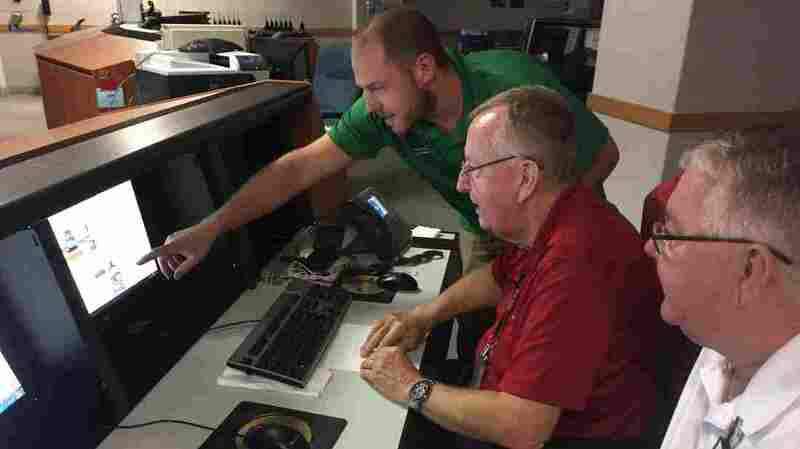 At the Kennedy Space Center, in Cape Canaveral, Fla., 120 people settled in to wait out Hurricane Irma and oversee some of the nation's premier space technology. That includes the Orion Multi-Purpose Crew Vehicle capsule. The four-person spacecraft — now in development — is intended to carry astronauts to the moon and beyond. "The Orion capsule, which is the return to human flight, is out here," says Brady Helms, an emergency management analyst with NASA. "We've got parts of the SLS, or the Space Launch System rocket ... some pieces from SpaceX ... We also have items that are being prepared to travel to the International Space Station." 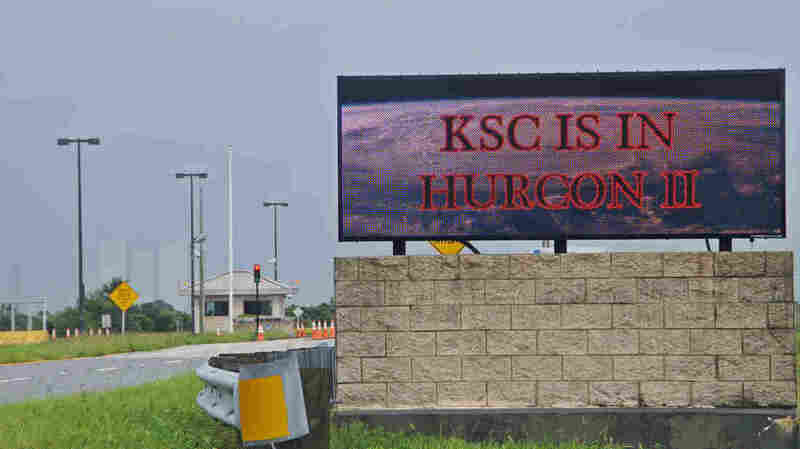 Every time a major storm hits the Space Coast, the ride-out crew members pack their toothbrushes and nonperishable food and settle in to spend the duration of the storm inside the Launch Control Center. Helms is riding out his second hurricane at the center, along with firefighters, security officers, building experts and contractors responsible for the hardware itself. The most sensitive equipment is secured in climate-controlled spaces. The challenge is to make sure that no matter what happens outside, nothing changes inside. "Humidity and temperature — those are the big two that affect the spacecraft," Helms tells NPR in a phone interview. For most people, if you rode out a hurricane and just lost air conditioning for a few days, it'd be a victory. For the Space Center, that's the worst-case scenario, Helms says. Brady Helms, Wayne Kee and John Cosat keep an eye on Hurricane Irma from inside the emergency operations center at the Launch Control Center at NASA's Kennedy Space Center. So before the storm arrives, there's intense preparation to line up generators and backup systems. After the storm is over, a damage assessment team will take over and see what, if anything, Irma hurt. Brady says the prep work starts long before the hurricane arrives. In the case of Irma, some projections had it aiming straight at the Space Coast, which meant the Kennedy Space Center was on high alert. As the trajectory moved westward, the danger to the center grew less acute. Instead of a direct hit, the eye would be more than 100 miles away. But Irma is a massive storm, and as of Sunday evening Cape Canaveral was still experiencing 35 mph gusts, with alerts to watch out for tornadoes. The Launch Control Center is fully secure, NASA says: It's built to withstand a direct hit from a Category 5 storm. (The famous Vehicle Assembly Building, however, has been damaged by hurricanes before, as have other buildings at the center.) There's plenty of food, and the staff can shower. But spending a few days there isn't exactly comfortable. One challenge, Helms says, is finding somewhere dark enough to sleep — the building is packed with emergency lights. There's not actually that much to do during the storm, Helms says. Some members of the ride-out crew watch movies or play games. Most keep an eye on the weather reports. And, well, this is NASA. So when they have a lot of time on their hands, what do they do? "A lot of it's data entry," Helms says.